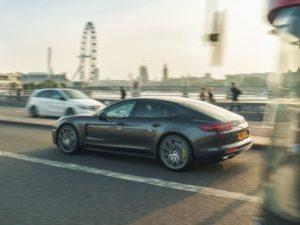 Porsche is launching a six-month trial of a fleet of plug-in hybrid chauffeur cars in London, offered through Volkswagen Group owned ride hailing service, Gett. The fleet of 100 vehicles includes the Cayenne and Panamera Plug-in Hybrids. Offered through Gett’s One Transport platform, which enables black cabs and executive chauffeur vehicles to be booked through a single source, the service will run until May 2018 and offer pickups in central London between Tuesday and Saturday. Journeys within central London will be cost a flat rate of £20, longer trips will be priced according to time and distance, shown in the Gett app. The fleet of 100 Porsches will include the Panamera and Cayenne plug-in hybrids, as well as the Macan SUV, using drivers trained at the Porsche Experience Centre at Silverstone. These will be available to existing Porsche customers, as well as ‘high value’ Gett users who might opt for to buy one of the vehicles in future.